Whether you're repairing a leak, removing a clog or replacing the pipes, taking apart and replacing a sink drain is a fairly simple task. It will require minimal preparation and the right tools. While removing a sink drain won't require a professional plumber, you should still familiarize yourself with the drain components before you start. The easiest way to do this is to find a diagram on the Internet or visit a local plumbing supply store. Using the right tools and being able to identify the drain components will greatly reduce the time it takes to complete the task. Turn off the water faucets. Also, to ensure that no one turns on the faucets while you're working, turn off the water supply valves, usually located behind the piping under the sink. Typically, there is a separate valve for hot and cold water. Place a shallow bucket or large pan directly under the U-shaped area of the sink drain known as the grease trap. This will catch any water still in the pipes when you remove the grease trap. Locate the coupling nuts (threaded joint covers) at both ends of the grease trap, and, using your wrench, turn the coupling nuts counter-clockwise until they are loose. Slide the loosened coupling nuts away from the pipe joints. Wiggle the grease trap back and forth until it separates from the other pipes and set it aside. Remove the coupling nut (if present) from the bottom of the strainer basket assembly. This will remove the last remaining segment of pipe from the bottom of the sink. Locate the rubber gasket at the top of the strainer basket, directly against the bottom of the sink. Loosen the locknut that secures the strainer basket to the bottom of the sink. If the components are old, they could stick. Use a flat-head screwdriver to gently pry the parts apart. Remove the rubber gasket and the strainer basket. If your pipes are made of iron, they may be harder to remove. The older the pipes are the more fragile they are. 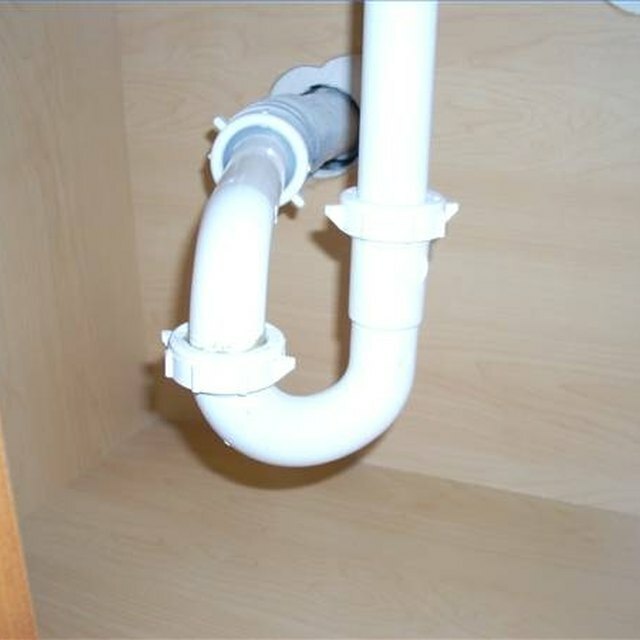 It's a good idea to replace these pipes with the most updated PVC or plastic pipes available. When the job becomes too difficult, always consult a professional plumber. If you have recently tried to use any chemical drain cleaners or clog removers, always begin by rinsing the pipes with cold water for 1 minute. If the clog still remains, use rubber or plastic gloves on your hands to avoid chemical burns while taking apart the pipes.